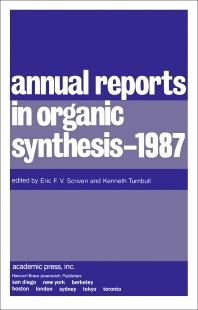 Annual Reports in Organic Synthesis — 1987 presents a collection of 49 abstracted chemistry journals that cover organic synthesis. The book is comprised of eight chapters that cover different aspects of organic synthesis, such as reaction types and methods. The first three chapters tackle carbon–carbon bond forming reactions, oxidations, and reductions. Chapter IV discusses synthesis of heterocycles, and Chapter V covers the use of protecting groups. Chapter VI talks about useful synthetic preparations. The last two chapters cover the miscellaneous reactions and reviews. The text will be useful to biochemists and other researchers who deal with organic synthesis.